Inverness Caledonian Thistle manager John Hughes would like to bring midfielder Iain Vigurs back to the club, but he is unsure whether his budget will allow. Vigurs has trained with Caley Thistle following a trial with Barnsley and is still looking for a club after being released by Motherwell. The 27-year-old former Ross County player has been keeping fit by playing for Highland League side Inverurie Locos as a trialist and Hughes would like to sign him if his budget is increased by the board. 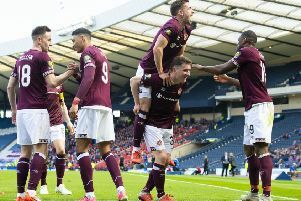 But, with Gary Warren out with a broken leg and fellow centre-back Josh Meekings struggling with a hip problem, Hughes has problems at the back, although he was impressed by Ross Draper’s performance in the heart of defence in Saturday’s 1-1 draw at St Johnstone. Hughes, whose side host Partick Thistle tomorrow night, said: “Iain acquitted himself very well. He missed a lot of football last year but his fitness levels are right up there with what I have at the club. “He gets on the ball and fits right in with my style of play. He never gives the ball away, he has been there and done it, he is accepted in the dressing room for his football ability. But everyone knows, with Gary Warren injured and we could do with another striker, that’s the positions we are trying to fill. “Now it’s all about spinning plates. Big Ross Draper was probably man of the match on Saturday, so if he can sit in there and fill the centre-half role it will maybe free up the money to go into midfield.